Horror shirt designs are a huge seller in the community and any time a unique design of a favorite film is discovered, fans will flock to purchase it. 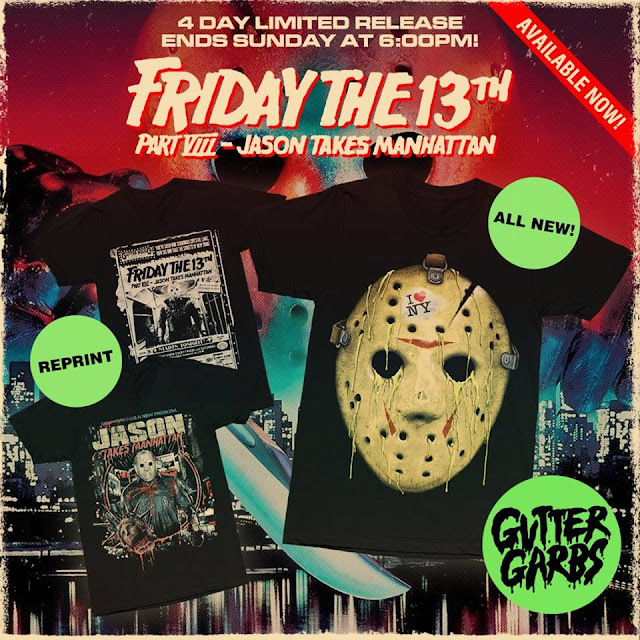 Starting today, shirt company Gutter Garbs unveiled their four day limited release for Friday The 13th Part VIII: Jason Takes Manhattan! The new shirt design "New York Toxicity" shows off the toxic waste infused hockey mask of Jason Voorhees. Other designs are from previous releases by Kyle Crawford. The Big Apple's in big trouble as indestructable psycho-fiend Jason Voorhees hits the road to New York -- and paints the town "red"
After a shocking return from the grave, the diabolical Jason ships out aboard a teen filled "love boat", bound for New York, which he soon transforms into the the ultimate voyage of the damned. Then one of his terrified victims escapes into the nightmarish maze of Manhattan's subways and sewers, only to confront Jason one final time.